1. I can only cycle with one hand when its my left hand is holding the handlebars. I can not remove my left hand from steering or I swerve into on coming traffic. 2. I can not sew in a circle or curve, but I can only crochet in the round. 3. Every time I have started a new job, something semi-calamitous happens on the first day or at the interview: soaked to the bone in a thunderstorm on the way there, viral conjunctivitis, one of the members of the interview panel falls asleep, kicked by a client...its a running joke around these parts. 4. I only watch movies with happy endings, can eat an entire container of sweet popcorn at the cinema and think the previews are the best bit. 1. 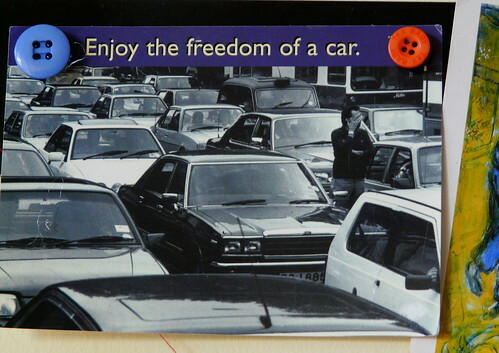 This postcard from Claire! It made a really dreadful day end with a silver lining! Thank you. 2. The way Ellis says "there you are" and eats so that almost every inch of his face is covered in whatever he is devouring. 3. Kevin, Ellis and I cycling back from a barbecue after a great day with wonderful new friends. 4. A new washing line so I can hang out even more clothes to dry when we have sun...if we have sun. 1. 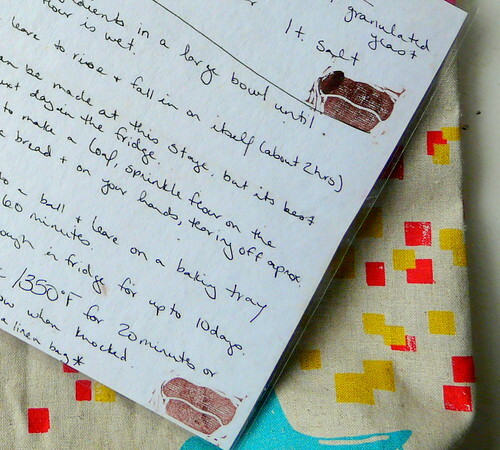 A house-warming gift of a linen bread bag and a laminated recipe of my favourite bread recipe. 2. 3 new leaf ipod/mobile phone covers as gifts to send around the world. 3. Food: Bread, potato salad twice, carrot salad, eggs, grilled sweet potato, pizza. 1. 6 Hours on a train through the highlands to meetings in Inverness and back. Work on the way there, re-reading Gift of Good Land on the way home. 2. Undertaking my first assignment for my Unravelling e-course. 3. Making my first batch of cheese...will it be mozzarella or ricotta??? 4. Putting in a fabric order with my new pay pal balance from selling on ebay...fabricworm, here I come!